Catholic News World : Easy #Novena to Saint Frances Cabrini - Patron of #Immigrants - SHARE this Prayer! Easy #Novena to Saint Frances Cabrini - Patron of #Immigrants - SHARE this Prayer! O God, the Holy Spirit, Comforter of the afflicted, Fountain of Light and Truth, through the ardent zeal of Your humble handmaid, St. Frances Xavier Cabrini, grant us Your all-powerful aid in our necessities, sanctify our souls and fill our minds with Divine Light that we may see the Holy Will of God in all things. 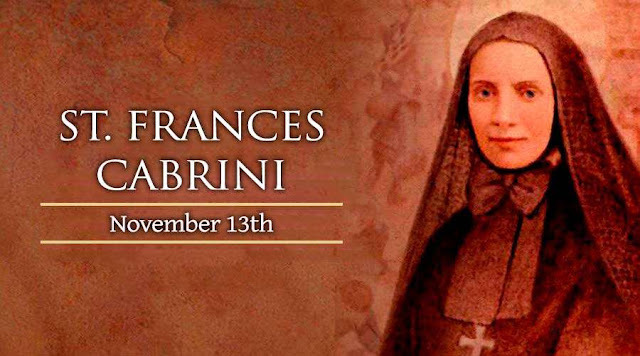 St. Frances Xavier Cabrini, beloved spouse of the Sacred Heart of Jesus, intercede for us that the favor we now ask may be granted.